Do you like Froggie Jump? Share it with your friends. 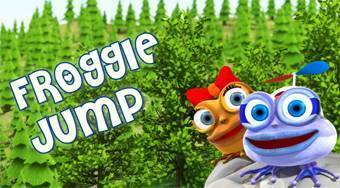 Froggie Jump is a wonderfully crafted adventure jumping game in which you have a total of twelve different levels of difficulty. In each round, move in the role of a cute frog named Joey on the playing field, overcome various obstacles and always get to your beloved frog kidnapped by a bad bear.